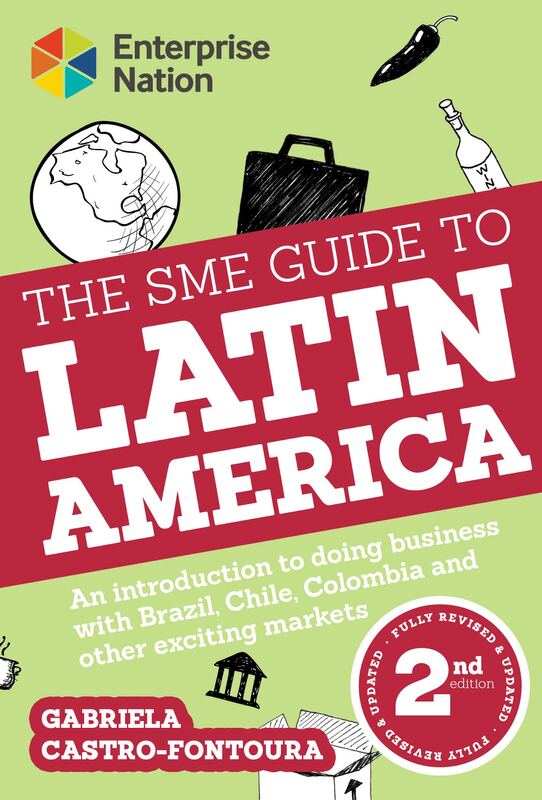 Watchlist: South America 2015 Fancy saving yourself a headache when exporting to Latin America? Retail is hot in South America. And supermarkets are leading the way. I am the sort of person that finds it interesting to pop into a supermarket every time I visit a new city. Call me weird, but I find it fascinating. What do people buy in this city? How do they display the goods and how to they stock up? How are price labels displayed and what is the check-out experience like? 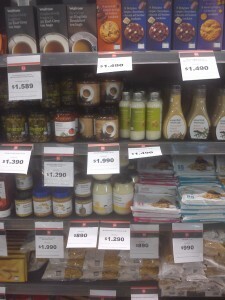 If you visit a supermarket in Uruguay, for example, you will find an incredible choice of dulce de leche, a local addiction, something similar to caramel sauce. If you visit a supermarket in Colombia, you will find the most amazing fruits, some of which I don’t even know the name of. Walking around a supermarket in Santiago de Chile a few months ago, I noticed that suddenly everyone seemed to be manically heading in the same direction. I wondered if they were giving something away. No, it was the time when fresh bread came out and Chileans, whose per capita bread consumption is one of the highest in the world, knew exactly where to go and what to do. 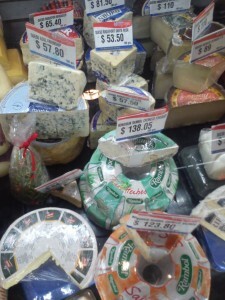 No Stilton, but some lovely imported cheese at Uruguayan supermarket. 1- Big chains dominate the scene. The likes of Carrefour and Walmart mean that purchasing is not always local and a lot of products we end up receiving are bought group-wide somewhere remote. Can you make the most of that? 2- Supermarkets lag in innovation behind Europe. Can you supply new ideas and technology? 3- Linked to the above, you will find that most supermarkets in South America are overly staffed, with assistants for example helping you to pack your bags. There are cultural reasons behind this. I personally see this shifting, but not as quickly as some would like. Not just food and drink. 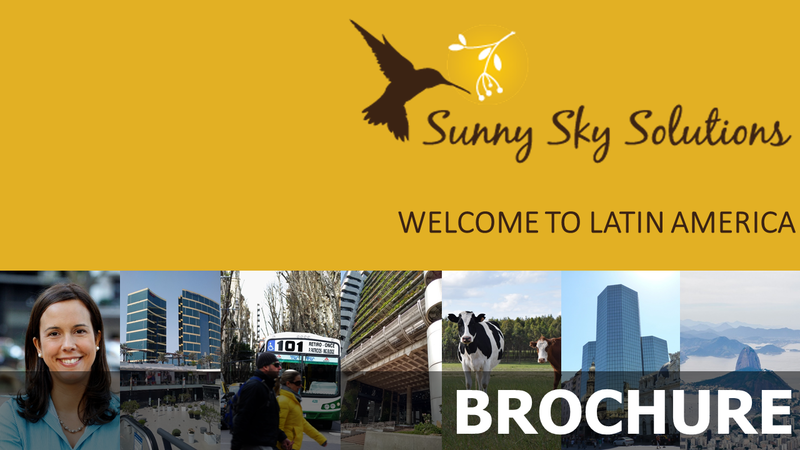 Santiago de Chile. 5- Although most supermarkets have some form of loyalty programme, I find them quite archaic and they could really exploit the information they gather a lot more efficiently, like Tesco does with Clubcard, for example, and offer consumers a much more targeted experience. 6- Just like all supermarkets aren’t the same, not all countries are the same in relation to them, and there are strong variations as well within countries. A study quoted in El Observador by Nielsen, shows that supermarkets, hypermarkets and self-service retailers represent 58% of consumer purchases (in value), while that figure is 86% in Brazil and 25% in Paraguay. Food for thought. Waitrose products at Unimarc, Chile. 7- The growth of gourmet food and drink consumption in South America means there are whole areas for these niche premium products in many supermarkets. In some cities, also expect some areas clearly aimed at expats (with your McVities Digestives and your horseradish sauce…) which sometimes also vary seasonally depending on the influx of tourists. 8- Who shops at supermarkets? 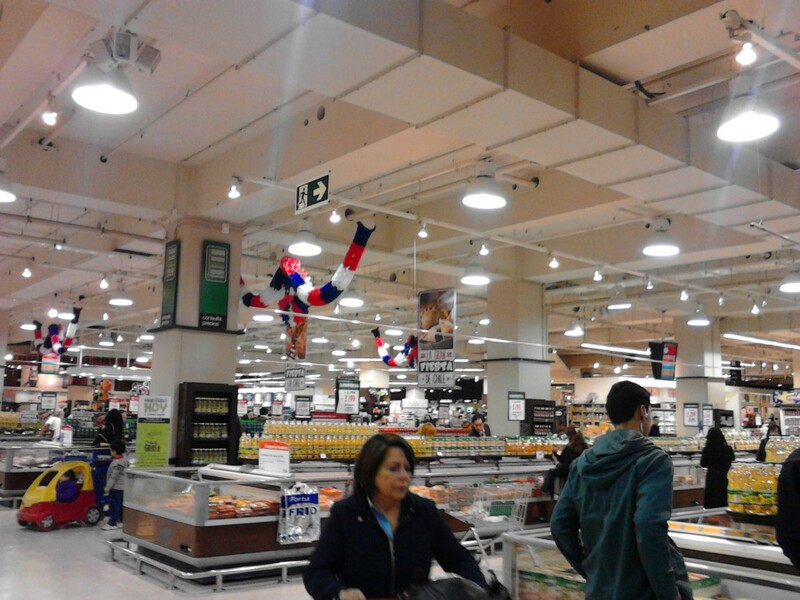 The study published in El Observador shows for example that in Uruguay, about 85% of supermarket customers are female. Are your products designed to be attractive to them? 9- The same study indicated that 70% of customers shop in a supermarket close to their home, usually no more than 10 blocks away. I remember driving from Skipton to Sainsbury’s in Keighley or to Tesco in Bradford; that would be considered very strange in most of South America. I have also noticed that out-of-town hypermarkets are rare (we have two huge ones in Uruguay, Geant, and MacroMercado, a kind of cash n carry). The study mentioned above by Nielsen shows that only 26% of people who own a car in Uruguay actually use it to go to the supermarket. 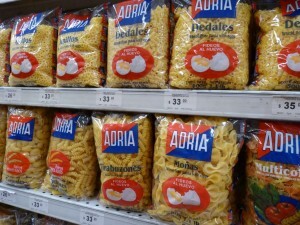 Lots and lots of different pasta shapes in Uruguay, a direct consequence of Italian immigration. 10- I always get asked about frozen food in South America and I have spotted that the variations are enormous. 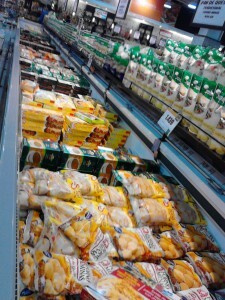 I find the frozen food aisles in Uruguay pretty small (and dominated by ice-cream and frozen potatoes, these latter ones mainly from Holland), while in Chile I have found much larger and varied selections. 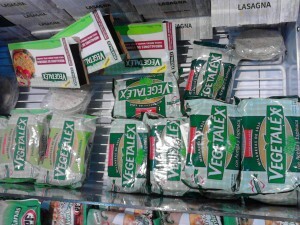 One chaotic and rather dull veggie frozen food section. Frozen food. Major supermarket in Santiago de Chile. 11- I also often get asked about online shopping (for supermarkets). Now, don’t get me started. Most supermarkets just don’t offer it. The ones that offer it vary considerably in service quality. Time slots of 5-8 hours, goods that are “not available” (like milk, eggs and water that you can actually see they have instore) and payment options that are not always that straightforward, are all deterrents. A nice gap in the market, or a market that’s not ready for it? I’m reading that internet is the way forward for retailers in Uruguay, and that it will be responsible for much of the 17.5% annual growth forecast to 2019 (El Observador, Grupo Radar). I’d like to see that happen! (please note that this is not specific to supermarkets). 12- The other thing that will shock you, particularly if used to the UK, is the lack of offers, particularly buy-one-get-one-free or 3×2. I miss them! British goodies at special supermarket event in Montevideo, Uruguay. 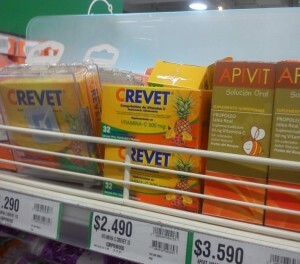 And the final word that I often get asked… how do I get my products into a South American supermarket? 1- You can sell directly to a supermarket. In which case, you need to be here, go to meetings, bring samples, have your materials in the local language, your prices and incoterms clear, as well as your lead times, shipping times, etc. They don’t have much time for you, to be honest, so make sure you impress them in 10 minutes. As you’d do with Tesco back home. Only far away and in another language. That is why this is often done through agents. 2- You can sell to a distributor that has a good relationship with the supermarket(s) you are targeting in the country/countries and city/cities you are targeting (or even in the neighbourhood you are targeting, remember that Sao Paulo, for example, has double the population of the whole of London). Pick your distributor very carefully because you probably will only have one go at each supermarket. If you change distributors, the supermarket won’t probably want to hear about your products again. Ask a lot of questions, particularly about their track record. What brands are they selling? How long have they been selling them for? How much a year? To which supermarkets? How about margins? Have they lost any representations recently? If you enjoyed this article, why not sign up to our complimentary monthly newsletter? I don’t even have a product to get into a supermarket, but I still found this an interesting article. 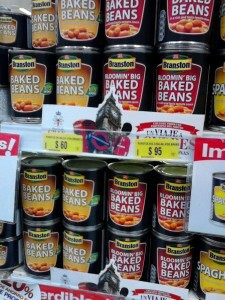 I too love to see how supermarkets differ and especially the product packaging. Are we both a bit sad??? I think that nosing around supermarkets abroad is a culturally valuable exercise, you see! It opens your mind to the fact that even the most basic things you take for granted can be different in another country. From where you find bicarbonate of soda (I blogged about that last year) to what goods are available and what they look like, it’s all so fascinating!